One of my favorite restaurants in the cities is Big Bowl. My sister and I typically get the chicken lettuce wraps for quick little appetizer. I whipped these up for my mom and sister this weekend with my own copycat recipe! Fully approved and enjoyed by all! 🙂 FYI just a tad messy and eating it with a fork looks stupid. Once chicken is cooked add sliced peppers, onion, carrots and water chestnuts. Saute for 3-4 minutes. Prepare the rice noodles according to package. I bought mine from Trader Joes in the refrigerated section- just boil for two minutes. Add noodles to chicken stir fry mixture. In a separate bowl mix all the ingredients for the dressing, add to chicken stir fry mixture in a bowl and refrigerate for 2-3 hours. Wash lettuce and fill the lettuce boats with refrigerated mixture. Top with chopped honey sesame cashews! Enjoy! One of the most important aspects of a good spaghetti sauce is having meat in it. Whether it be ground beef or ground turkey….it is a must. To spice it up, I used grass-fed buffalo meat which is a wonderfully lean and flavorful choice. I used up the rest of my tomatoes and created a delicious sauce as well! 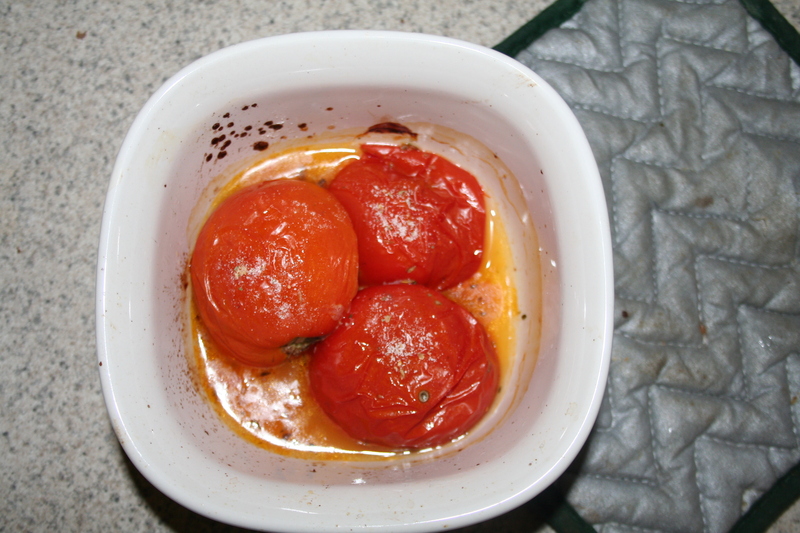 Cut tomatoes in half place in baking dish with 2 Tbs olive oil, salt, garlic powder and oregano. Bake at 375 for 10-15 minutes. 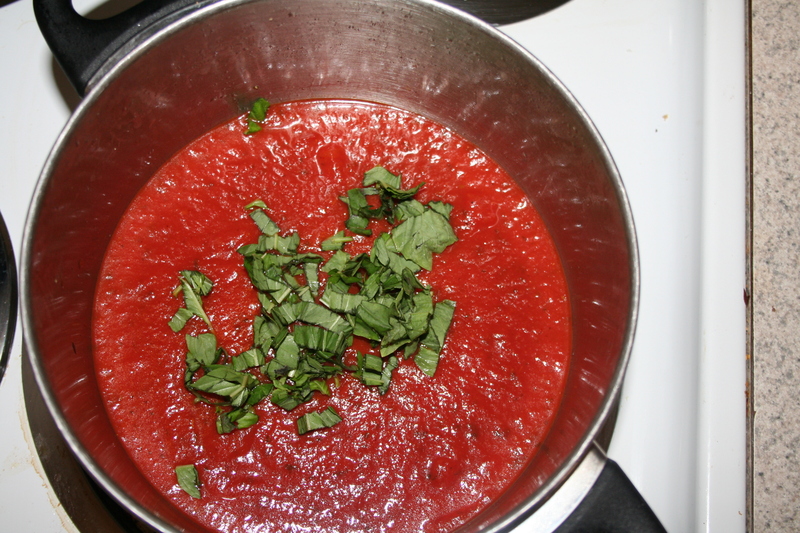 In a blender, add roasted tomatoes, tomato paste, 2 Tbs olive oil and 1/2 Tbs Italian Seasoning . Pulse for 10 seconds. Pour into a pot and set to a simmer (low medium heat), Add water slowly. Chop up onion, garlic and basil (mince). Add to the sauce. Let simmer for 20 minutes. Stirring occasionally. While that cooks, in a separate pan start browning buffalo meat on medium heat. Add to sauce when cooked. For the zucchini, I cut into thin strips by using a cheese slicer. Otherwise using a sharp knife and a steady hand will work. OR even better is a fancy veggie spiralizer. Boil zucchini noodles in a sauce pan with 2-3 cups of water for 5-7 minutes or until tender. Assemble a bed of noodles and a thick coat of tomato sauce! Enjoy! Rainy days call for soup and grilled cheese. So, that is exactly what was on the menu for tonights dinner. Crock pot recipes are my favorite because it does the work for you. This recipe was basically a combination of what I had in the fridge and it turned out superb. You can alter the recipe with different veggies or meat, but I think this was prime! Separate the chicken, removing the skin and bones. Chop up chicken into small pieces. I did not use the entire chicken but about half. Chop up squash, red bell pepper, white mushroom in to small pieces. Mince onion and garlic. In the crock pot add container of Swanson Chicken Broth, chopped veggies, onion, garlic and chicken. Cook on low/medium heat for 1-2 hours. This allows for the veggies to soften for a while before adding the rice. Adding the rice/grain or noodle early on in the cooking process can lead to a mushy disaster. Especially if you make enough for leftovers. Refreshing side or lunch option with a range of different ingredients! Inspired by a dish I had at a local Mediterranean restaurant. Bake, stir fry or grill chicken. Another option is to just buy rotisserie chicken breast and chop up into small pieces. Cook quinoa, typically one part quinoa to 2 parts water. I use chicken broth instead of water to add flavor. Wash, cut and boil water and add the asparagus in a pot for 5-6 minutes until mildly tender. Add all ingredients into a bowl. Chop up basil and mix with balsamic and olive oil. Add the dressing to the mixture and refrigerate for at least 1 hour. Salt pepper and ENJOY! Need a snack to go? Fruit parfaits are an easy snack you can prep ahead of time and pack up for a quick snack at work. I packed mine up in a mason jar and had a lil picnic! First layer add the chopped fruit. Putting the fruit on the bottom works best because the juices can all sit at the bottom without getting the granola too soggy. Second layer yogurt and honey. Lastly top with nutty, cinnamon granola! Pack it up, and enjoy! Need a snack idea? Dark chocolate, banana and peanut butter should solve that problem! Spread a good heap of dark chocolate pb on a rice cake, slice up banana and top the cake! I add an extra spoonful of pb to keep me satisfied for a while! Enjoy! First pre-heat oven to 400. While that preheats, chop and pan fry chicken and bacon. Chop up potatoes into THIN slices and coat BOTH sides of the potato with olive oil. If you have a fancy brush use that or just give them a good coating. Through some salt on. Bake for 10-15 Minutes, Flip half way through. Chop up tomatoes and banana peppers into small pieces. Grab a plate, layer the crispy potatoes,meat,peppers,tomato and cheese. Give it a good nuke in the microwave and top with salsa,guac or desired topping! Chop up Chicken and pan fry in olive oil and sesame oil. Need a quick snack idea! Give this a go! Ready in five minutes and is a tasty little bite for a spark of energy! For starters I am thankful for having so many relatives in town. Not only do they let me use their kitchen, but they supply me with good food, wine and company. As far as the meal went, I had a few restrictions to meet everyones needs and preferences; no gluten, dairy and relatively low carb. It wasn’t much of struggle and the meal just kinda worked its way together thankfully! Here’s a photo of Uncle Dave in his shining moment of glory! Ingredients (3-4 servings) Thick Salmon Flank 2 Tbs Olive Oil 1 Tbs Fresh Lemon Juice Salt, Pepper, Minced Garlic Avocado Cilantro Lime Dipping Sauce 1 Avocado 2 Tbs Avocado Mayo 5-6 pieces Chopped Cilantro 1 Tbs Lemon Juice salt, pepper, garlic salt Green Bean Bacon Bake Bag of Stemmed and Ready Green Beans 5-6 Strips chopped bacon Paprika Brown Sugar Balsamic Tomato Basil Salad 1 container grape tomatoes 9-10 small Fresh Mozzarella balls 7-8 leaves Fresh Basil Balsamic, Olive Oil, Salt Directions 1) For the salmon the baking time depends on how thick cut your salmon piece is. 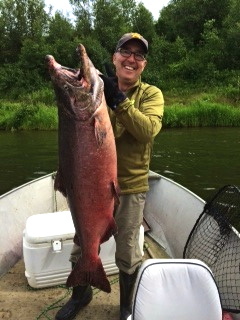 Ours was BIG! Wrap the salmon foil with olive oil, lemon juice, and seasonings. Slice the salmon horizontally and place lemon slices in between. 2) Cover the salmon with more foil and bake in a pan at 300 degrees for 25-30 minutes. Check and see if the salmon falls apart. If not bake for longer. Avocado Dressing 1) In a blender, add one avocado, mayo, cilantro, garlic and lemon juice. Blend. Add seasonings. If you want a thinner sauce add olive oil to thin it out. Green Bean Side 1) Slice and fry up bacon (until cooked but not crispy because it will be baked later). Add Smoked Paprika, sprinkle with brown sugar, salt and a good coat of balsamic dressing. Note- buy the good balsamic from an olive oil store, it has a sweet smooth taste versus the bitter crap from the grocery store. An investment but TOTALLY worth it. 2) In a small cooking pan add the green beans and coat with the bacon and sauce. Don’t drain the grease from the bacon. It adds a lot more flavor and keeps things from drying out. 3) Bake at 325 for 20 minutes Mozzarella Tomato Basil Side 1) Wash and slice up tomato in half 2) chop up fresh basil until minced 3) Cut mozzarella balls in half 4) Add tomato, basil, mozzarella into a small bowl. Add a few tablespoons balsamic and olive oil. Add salt or greek seasoning on top. Place in the fridge to let flavors marinate together. ENJOYYYYYYY!!!! !